The MAPIC, the 1st international exhibition dedicated to retail property market, hosted in Cannes last 16-17 November 2016. This year, for the first time, a 1 000m2 area called “Trends Hub” was dedicated to Innovation. 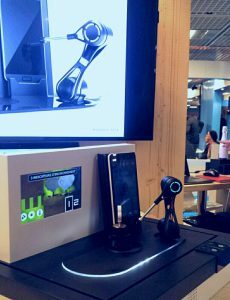 Key Infuser was there to present KiOne robot’s new design. Interesting discussions about the product and about the interest of the technology to increase customer’s experience in retail (shopping center’s application demo, etc). We thank Pôle de Compétitivité SCS de la région PACA for this opportunity to have a booth during this prestigious event.